Now that your Christmas decor is stored away and January is over, your home is probably feeling a little empty and blah. We know the perfect way to help you shake off the cabin fever and give your space a fresh look without breaking the bank. Our Kendrick Home (KH) design team has been having fun creating new spring and every day prints to mix it up in 2018. These are a few of our favorites that have recently hit The Markket showroom! This 24 x 8″ Lucky print is a simple and chic way to bring a little green and Saint Patrick’s Day spirit into your home. What we love most about it, is it’s very transitional into spring and you can keep it up long after March 17th. These Easter prints have us counting the days until spring. The 18 x 18″ Cottontails and 12 x 12″ Hoppy Spring fit into a variety of spaces and home styles. And really how cute is that bunny?! But if specific holiday prints aren’t really your style we have a wide selection of everyday prints that we add to daily. 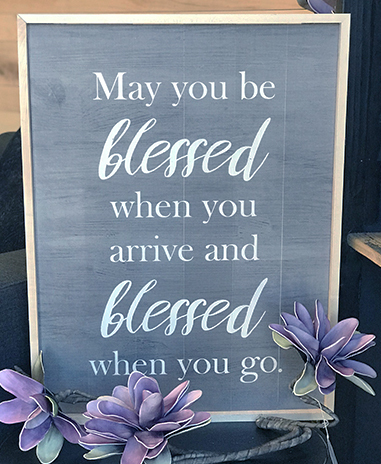 Among our newest prints is the 18 x 24″ Blessed When You Go with a maple frame. If you see a design you like, order it through the store and we will have it ready for you. We make custom designs and can build any size. Just ask our team and we will make your idea come to life.